A great ball contraption (often abbreviated as GBC) is a machine which receives soccer balls or basketballs from one module and passes them to another module, rather like a bucket brigade. Modules built according to the GBC standard can be assembled into a collaborative display without modification. The GBC standard is minimal, permitting the builder great flexibility in designing the mechanism by which balls are moved from the input to the output. The otherwise pointless handling of balls, and the myriad ways this is accomplished, gives great ball contraptions the impression of a Rube Goldberg machine. Each module should have an "in" basket, and will move balls to the next module's "in" basket. The in basket should be 10 studs by 10 studs (outside dimension) with an 8x8 opening, and should be 10 bricks tall. The in basket should be located on the left side of the module, and output should go to the right. Each module should be able to accept balls at an average rate of 1 ball per second. Balls can be passed continuously, or in a batch. A batch should not exceed 30 balls. Strictly speaking, a great ball contraption is two or more modules which pass balls one module to another. Informally, the abbreviation GBC is often used to refer to a single module. Because of this ambiguity, a series of modules may be specified as a GBC loop, GBC collaboration, or GBC layout. Modules can be childishly simple or dizzyingly complex, so people of all building levels can participate. Each person can build one (or more) module(s). See Upcoming GBC Events for a list of events that will feature GBCs. If you are interested in coordinating a public GBC collaboration, see Coordinating a GBC. 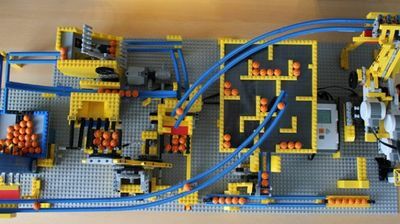 A standard module must use LEGO soccer balls or basketballs. In 2013 an orange soccer ball appeared in 41008 Heartlake City Pool and a white ball with a Friends logo appeared shortly thereafter. Often a lifter requires that balls arrive single file. Here are some mechanisms that achieve this. Rotating floor with downward side exit. Batches of balls behave differently than single ones. A module's behavior when receiving a batch of 30 balls can be very different than when receiving balls one at a time. Test both conditions. If it can jam, it will. Design modules so that they clear themselves, tolerate a few stuck balls, or fail gracefully. Avoid designing such that when there's a jam, something has to break. Use of clutch gears, belt drives and flexible elements can help keep disaster at bay. Funnels jam. Avoid passages that narrow. If unavoidable, provide some kind of agitation to keep balls moving. Dead spots bother people. Frequently there will be places in a GBC where balls will park themselves. This isn't technically a problem as long as a stopped ball doesn't block the flow. However, onlookers will invariably let you know a ball is "stuck" and will instinctively reach out to free it. Modelers who don't want people touching their MOCs may want to eliminate such dead spots. Gears break. Smaller ones are especially prone, such as the 8-tooth and 12-tooth bevel gears. They should either be used where the maximum possible torque is limited or where they are easy to replace. Display tables aren't level. Modules which work great on a level table can suffer horribly when tilted slightly. Test with each edge lifted by one or two plates, or be prepared to fiddle with leveling it when on display. Recirculation helps. A module which can feed balls to itself is not only cool, but it simplifies testing and allows it to be displayed as a stand-alone GBC. Shovel with instructions by Philippe E. Hurbain. A long list of possible methods to lift balls up from the in basket before passing them on (either to a widget or to the next in basket), can be found at Team Hassenplug. Some examples are given here. Clock lift: picture a slightly tipped-back clock face, with a “C” shaped cup on the end of the minute hand. At the bottom (“6 o’clock”) it scoops a ball (or balls) into the cup from a bin, rotating them up the face of the clock. Near the top (say between 11 & 12 o’clock) the face is cut away, allowing the balls to fall out and into a chute or receiver. conveyor: moves balls up incline (or horizontally). May use idler wheels/gears to change shape of path. To ensure feeding from hopper, “bumpers” or “sweeps” might be used to stir the hopper. wave: a wave motion propels balls forward, like nico71's The Wave. wheel lift: perhaps based on the Hailfire Droid wheels, the wheel lays in a slightly inclined cavity with the bottom having a shallow trench to lower the inner rim level with the attached hopper floor. At the top of the cavity the rear wall is missing, allowing balls to roll out of the open cells attached rigidly to the wheel’s inner rim. A hub-less wheel like the Hailfire wheel can be rotated by resting it on regular driven wheels on the inner border of the cavity. A second wheel can be used as a second stage, set above and just behind the lower wheel/cavity assembly. ↑ 1.0 1.1 1.2 "The Great Ball Contraption". Team Hassenplug. <http://www.teamhassenplug.org/GBC/>. Facts about "Great ball contraption"
This page was last edited on 28 December 2017, at 03:39.